This is a must for every trainer's tool box (or bag)! 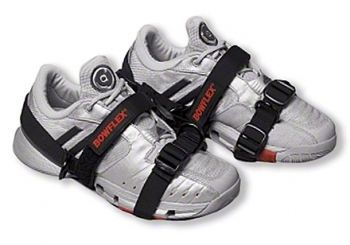 This foot harness originally made by Bowflex has 5 points for cable or tubing attachment. The top, medial, lateral, and heel, are via a metal D ring; bottom/sole has a flat webbing strap for attachment and doesn't impair walking in them. Foot harness is easy to put on and take off. Just put them on at the beginning of a session and they'll be there for any exercise. You can walk, do cardio, etc. unobstructed, then immediately jump to your next hip, knee, or ankle exercise. It fastens to the foot securely and won't slip or slide during use.